Sometimes you just want to be fancy. And sometimes things in life just deserve some small amount of fanciness, and you just must oblige with a cake. Look guys, those are just the rules, I didn’t make ’em! But apparently I’m here to enforce them..? Whatever. Here’s the first thing, buy yourself some 6 inch round cake pans, it’s just nice. Like, this recipe can be made using two 8 inch standard pans, but it seems a bit less fancy. You know what I said about being fancy guys. 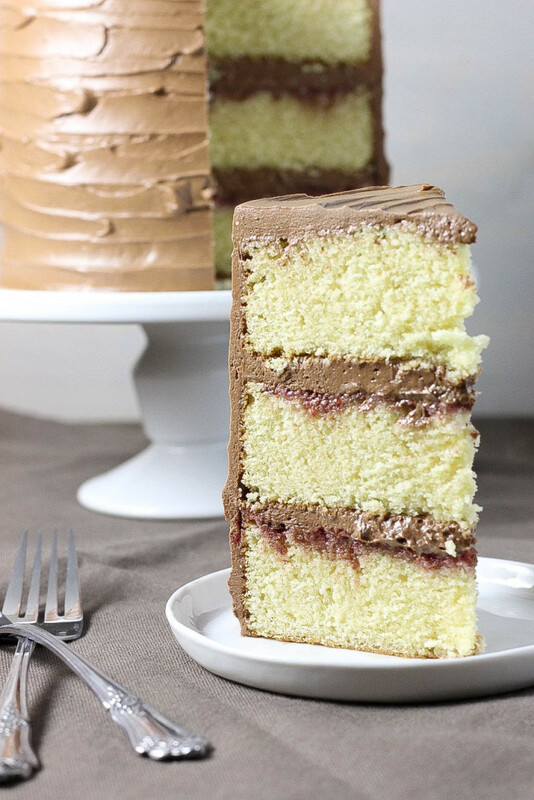 And with 6-inch pans, you can make these tall, pretty cakes without having to make, like, a ton of cake. Alright so, now that we’ve got the fancy down, I have some exciting news to share. A couple of days ago I officially signed the paperwork, and I’m now working on publishing a cookbook! I’m working with Graphic Arts Books, and it’s going to be like, a real cookbook, that they sell in real stores you guys. IT’S CRAZY. This is something I’ve wanted for a really long time, but I’ve always thought of it as a long-term goal, and it’s kind of blowing my mind still. I’ve been baking nearly every day of the week because I am insanely excited (my co-workers are reaping some sweet rewards right now). I’ll share more about the book later on, once we’re a bit further into the process, but I will say that our anticipated release will be in October of 2018! EEEEE! Alright, back to the cake, I’m calling it the celebration cake, cause, well you know. 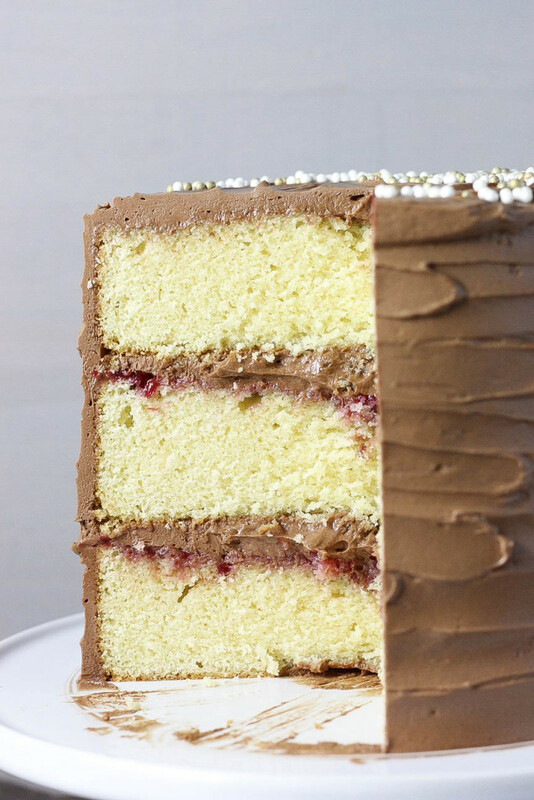 Anyways here’s the deal; it has sweet vanilla pound cake layers, thin layers of raspberry jam, and chocolate swiss meringue buttercream. It’s everything. 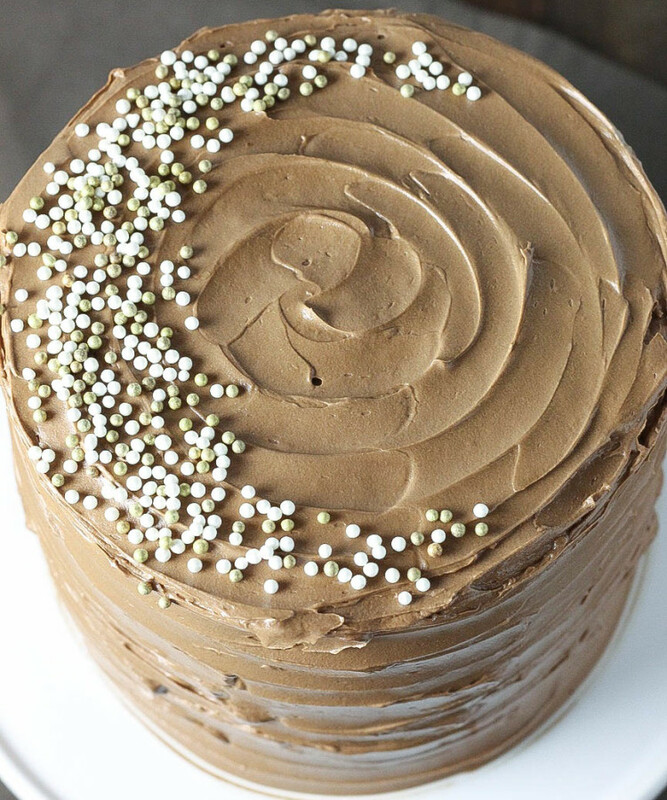 On the buttercream- listen, every single time I have ever made swiss meringue buttercream, I’ve been 99% sure I screwed it up. I always think to myself “Alright it’s cool, I have more eggs and butter, I’ll try again. 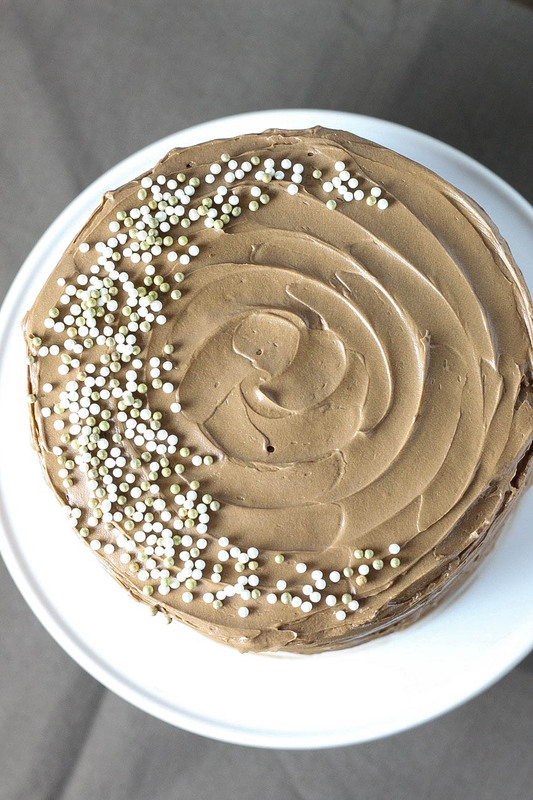 Imma just whip it a little longer and then give up.” And then I walk away and come back, and it’s magically become this silky, beautiful frosting. Don’t. Give. Up. It looks weird for a while, and all broken and messed up, but it’ll come back together, really. I hope today you have something to celebrate, and it’s totally okay if that something is that it’s Thursday. Enjoy! Preheat the oven to 350 degrees, and grease three 6 inch cake pans, or two 8 inch cake pans. In a large bowl, beat together the butter and sugar until fluffy. Beat in the eggs, vanilla extract, and almond extract. Add in the flour mixture and the whole milk alternating, starting and ending with the flour. Beat for 1-2 extra minutes, until the batter is very smooth. Divide the batter evenly into each of your cake pans. Bake for 35-40 minutes for 6 inch pans, or for 45 minutes for 8 inch pans, until a cake tester comes out clean. Cool cakes slightly, and then turn them out of the pans. Wrap in plastic wrap, and freeze for 30-45 minutes, so the cakes are easier to work with. Trim your cakes so they are flat on top. 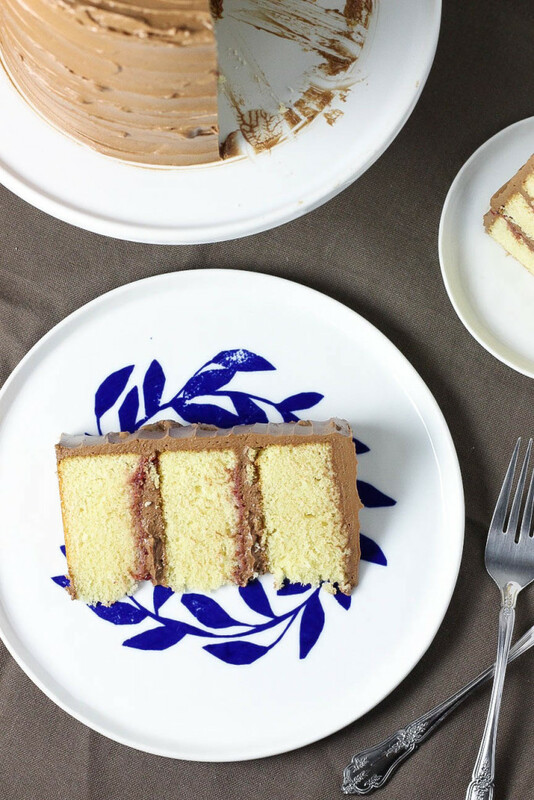 Place your first layer on your plate or cake stand. Spread half of the raspberry jam onto the cake in an even, thin layer. Top with about 1/3 cup of frosting. Repeat this process for the second layer. 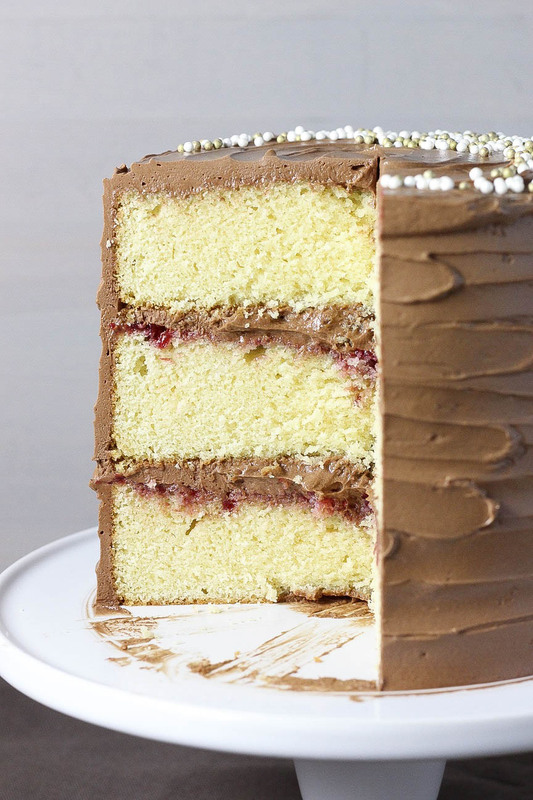 Top with the final layer of cake, and frost top and sides with remaining frosting. 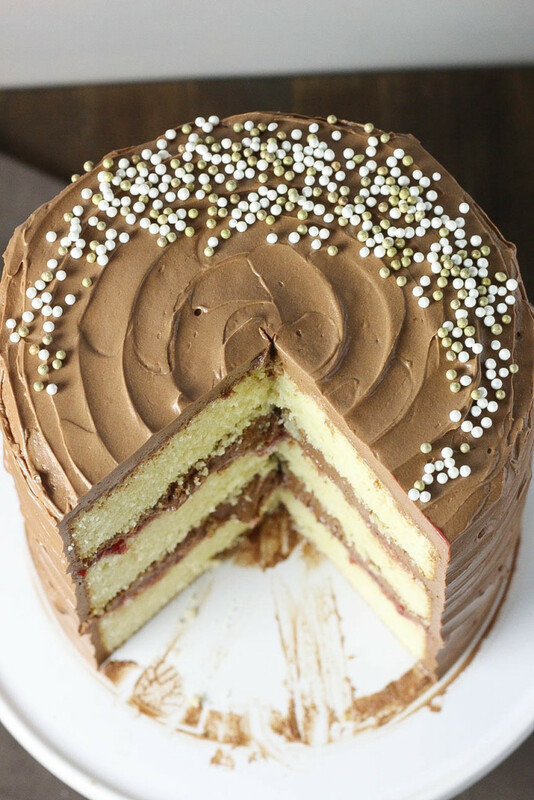 Gently drag a small spatula around the cake to create the ringed look. Top with sprinkles for extra fancy. Couldn't be more proud and happy for you!!!! You deserve it! Oh and the cake looks amazing too!